I am literally so shocked October starts this weekend. Anyone else?! 2016 is going by so, so quickly. Time flies when you’re having fun, I guess! I would love to get a couple of these metallic gold pumpkins for my dining table. 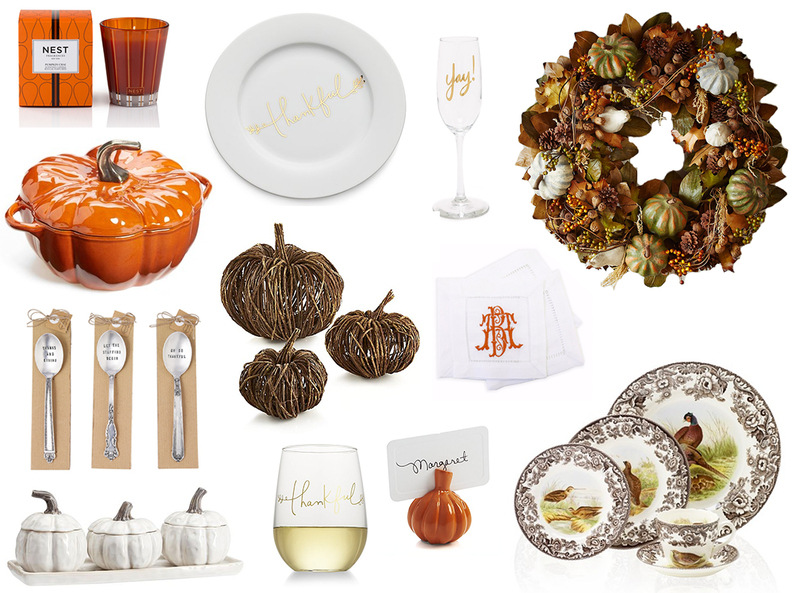 Such a pretty addition to any fall tablescape! Speaking of metallic gold pumpkins, this little salt & pepper set is adorable. These lit wire pumpkins are a subtle and modern option for your yard or front porch. No cheesy decorations with those! If you live in a townhouse with HOA rules regarding front door decor (like I do), try a halloween-themed doormat like this one, this one or this one. For the mantle, style these BOO letters with some mini pumpkins of various sizes and colors! This is technically not decor related, but these Halloween pancake molds are too cute! Perfect for the kiddos. Snag this pumpkin spice simple syrup for your pantry for adding to lattes, cocktails, pancakes and more! I have been wanting that Staub cast iron pumpkin for years but can’t seem to rationalize it….but it’s so cute! Great picks! Everything about this makes me insanely happy! I love the thankful plates and cups! Ahh love those metallic pumpkins, all my decor has some sort of gold or sparkle to it :) Happy Friday!